The Chelsea Piers Sports and Entertainment Complex offers a variety of athletic activities, including golf, skating, batting cages, bowling, a gym and even a spa. Chelsea Piers is also home to event spaces, including Pier Sixty - The Lighthouse and several sightseeing cruises dock at Chelsea Piers. 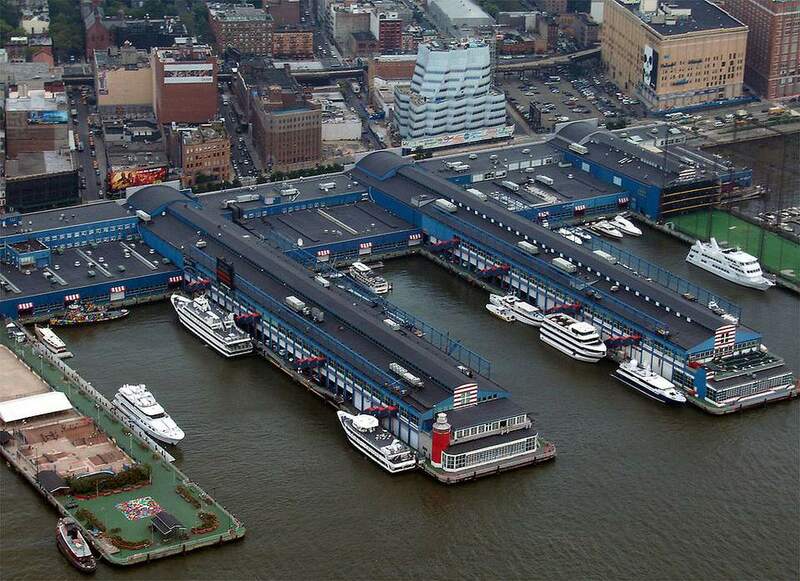 Chelsea Piers first opened in 1910 as a passenger ship terminal. Even before its opening, the newest luxury ocean liners were docking there, including the Lusitania and the Mauretania. The Titanic was scheduled to dock at Chelsea Piers on April 16, 1912, but it sank two days earlier when it hit an iceberg. On April 20, 1912 Cunard's Carpathia docked at Chelsea Piers carrying 675 rescued passengers from the Titanic. Immigrants in steerage class who arrived at Chelsea Piers and were then ferried over to Ellis Island for processing. Although the piers were used throughout the first and second World Wars, they became too small for the larger passenger ships that were introduced in the 1930s. Compounding that, in 1958 commercial flights to Europe began and transatlantic passenger service was greatly diminished. The Piers were then used exclusively for cargo until 1967 when the last remaining tenants moved operations to New Jersey. For years after that, the piers were used primarily for storage (impounding, customs, etc.). As interest in waterways redevelopment grew, plans were created for what was to become the new Chelsea Piers in 1992. Ground was broken in 1994 and the reinvented Chelsea Piers were opened in stages beginning in 1995. Allow plenty of time to arrive at Chelsea Piers. Walking from the subway can take 20-30 minutes and there is often traffic on the West Side Highway making driving (or taking a taxi) sometimes slow as well. Know where you're headed at Chelsea Piers -- each area is operated somewhat independently, and staff from one area won't necessarily know much about other areas. Bus/Subway: The final stop on the M23 bus (running West along 23rd Street) will bring you directly to the northern entrance to Chelsea Piers. It takes about 10 minutes from the 23rd Street stop on the C/E. The M14 bus stops at the southern entrance to Chelsea Piers at 18th Street. Driving: Enter from 23rd Street and the West Side Highway. Valet and Self-Parking are available at the Chelsea Piers.